tection and Response Agency (NOSDRA) has called on the military to establish an Oil Spill Response Base (OSRB) for quick intervention during oil spill emergencies. Mr Peter Idabor, the Director General of the agency, made the call during a courtesy visit to Vice Admiral Usman Jibril, the Chief of Naval Staff, in Abuja. Idabor said the base, if established, would serve as a veritable security for quick response and intervention by the agency during oil spill emergencies. He recalled the Bonga oil spill incident and commended the Navy for providing a vessel to NOSDRA that ensured quick response. According to him, crises usually occurred between affected communities and companies involved during oil spill emergencies. He said partnership with the Navy had become critical due to its role in providing security to the maritime environment. “It has become more critical for us to partner with the Nigerian Navy, especially when it has to do with issues relating to oil spill in this country. “When there is a large oil spill, there is usually conflict between the community and the company involved. He said that most of the deaths in the Niger Delta had positive correlations with oil spillage. He explained that people were at the risk of being affected by eating food that come from such polluted environment. He also said the life span of most Nigerians was shortening due to the effect oil spill on the ecosystem. “The attitudes of our oil explorers, especially when spills occur, it does not bother them that over a million of chemicals are spilled into the sea, which is very dangerous to health. Responding, Jibril said the Navy was familiar with the operation of the agency, adding that it would support NOSDRA to stop oil spill in the country. He said the force was also aware of the effects of oil spill to aquatic life and the environment. The Navy Chief also commended the agency’s cooperation with the military, saying “you have reduced spillage and its attendant effects in the country within this few days. “We are ready to contribute to stop oil spillage and we are ready to give to you information about spillage whenever they occur. 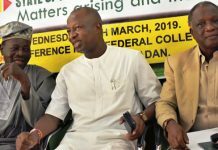 He however, said the delay in the release of boats to the agency was to control their misuse and advised the agency’s management to henceforth, put in its administrative request at their time of need. He gave an assurance that the Navy would reduce administrative bottlenecks to enable the agency to access the facility during emergencies. Jibril, however, sought the support of NOSDRA in the provision of infrastructure to the force, saying, “we need to support one another to achieve our goals.